Kano Yoshinobu was head of the Saruya-machi branch of the Edo Kano school, whose primary duty was to supply works to the Shogunate and feudal lords. 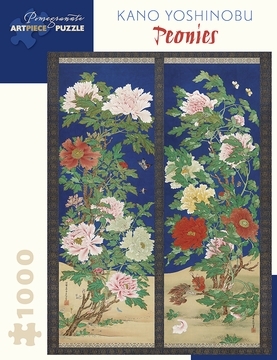 The brocade mounting of these ornate hanging scrolls contains the triple hollyhock crest of the ruling Tokugawa family. Most of the pictorial space is occupied by stands of giant peonies in full bloom. Butterflies have gathered in search of nectar, and they are joined by dragonflies and grasshoppers. The peonies in the right-hand scroll are tossed by a breeze. Dandelions blossom at the bottom left of the left-hand scroll. The white, pink, yellow, and red of the peonies stand out in brilliant contrast to the luminous dark-blue background.